Doug, in typical humorous DeMuro fashion, brought up that females aren't really into cars. While some females may like cars, having a fancy car in and of itself is not going to make you more attractive to women. This got me thinking about how my wife feels about automobiles. Mrs. Automatch is not what I would call a "gear-head," through she is very tolerant of my obsession. It helps that my sickness brings in a few dollars and has paid for several vacations. Sometimes, I am confused by what she likes. 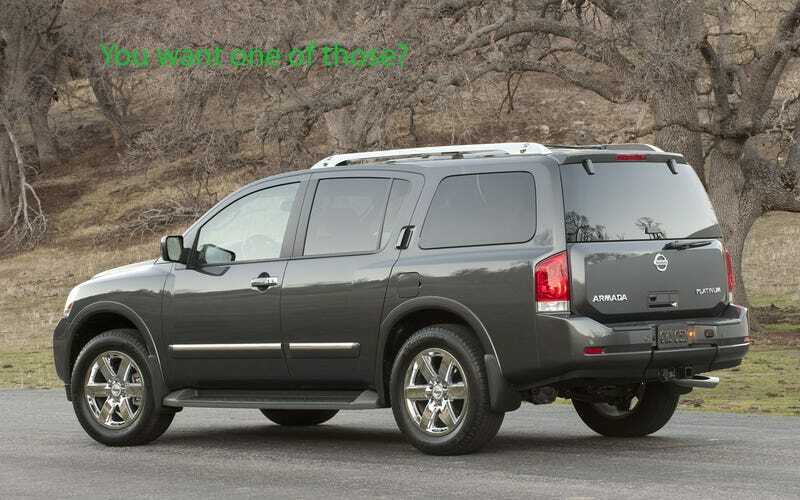 On our nightly walks around the neighborhood we pass several Nissan Armadas. On more than one occasion she has said, "If I didn't have to drive a minivan, I would get one of those….or a Honda Pilot." The Pilot I get; after all it does seem to be the default vehicle of choice for MAMs (mom's avoiding the minivan)...but the Armada? It is big, it's awkward, and it eats gas like a T-rex at an endless hot-wing buffet. Oh well...at least she hates the Armada's ugly cousin. Also, In a recent super-cool turn of events she alone, came up with the idea that we should decorate our son's bedroom with a vintage racing theme. What are some vehicles that your significant others dig or don't dig? Any surprises?